Hardcover, 8 x 9.75 in. / 88 pgs. Instigated by a conversation between Jens Hoffman and artist Carsten Höller after the opening of Documenta 11, this project provocatively questions the ascent of the curator, the value of the artist as curator, the future of international exhibitions and many less easily summarized tangents. 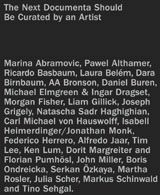 Exhibited virtually on the e-flux website, The Next Documenta Should be Curated by an Artist is really much more of a question than a statement, a question to which a dozen or so artists responded in a varied manner, including Marina Abramovic, Pawel Althamer, AA Bronson, Daniel Buren, Liam Gillick, Joseph Grigely, Alfredo Jaar, Ken Lum, John Miller and Martha Rosler. Some offered considered expository positions and formal exhibition proposals, others contributed brief wit and poetic statements. 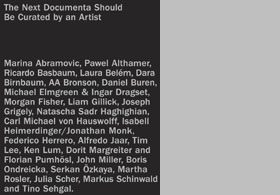 The Next Documenta Should be Curated by an Artist offers an experimental means of questioning a relevant topic through one of the most important exhibitions on the international scene. FORMAT: Hardcover, 8 x 9.75 in. / 88 pgs.